Parts are parts, right? Not exactly. Your air compressor is a vital part of your operation and you want to take care of it, keep it running efficiently and economically and ensure it stays that way for a long time. You wouldn’t put generic oil and parts in your car and trust them to last. Why would you treat your compressed air system any different? There are things you need to know about aftermarket parts vs. Original Equipment Manufacturer parts. OEM parts can carry a higher cost; however, they are engineered to be an exact replacement for the original component. This can make sure you get the most out of your air compressor. In many cases we cannot afford for our compressors to be “down” or not functioning properly. Utilizing OEM parts can help ensure you are servicing your air compressor with the manufacturers’ suggested replacement components. OEM parts are usually a requirement to receive coverage from the manufacturers warranty plan. In many cases utilizing OEM parts can offer an option for extended coverage. This can prolong the life of air compressor and give you confidence that the compressor is covered. Don’t be caught off guard when the unexpected occurs and your warranty coverage is invalid due to saving a few cents on a part or lubricant. OEM parts work exactly as the one you are replacing. They are the same components the air compressor were manufactured with and gives you a taste of familiarity and performance. Other brands of aftermarket parts may not work correctly or be of lesser quality. OEM parts are tested with the machines and matched to specifications of the original machine design. OEM parts are the best choice for your air compressor. When looking at the guidelines above its easy to see the value in servicing your air compressor with OEM parts such as air filters, oil filters and lubricants. Following the manufacturers published maintenance schedule and utilizing these OEM parts can ensure you get the longest life out of your investment and an ROI that can benefit your bottom line. 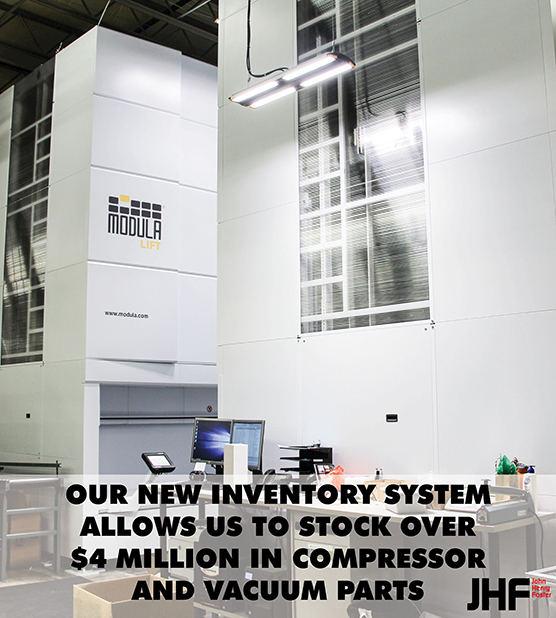 Please contact us today at 651.452.8452 or request more information to learn about our vast OEM air compressor parts inventory and the rest of our product line and service offerings. « Ready to Install Your Piping System?